Motherwort is primarily an herb of the heart. Chinese studies have found that extracts of aerial parts of Motherwort decrease clotting and lowers the level of fat in the blood. Motherwort can slow heart palpitations and rapid heartbeat. In ancient China, motherwort was reputed to promote longevity with stories of people whose water source was a stream flowing through the banks of motherwort, living to be 130 years and longer. Medicinally, Motherwort has sedative effects, decreasing muscle spasm and temporarily lowering blood pressure. It seems that motherwort lowers stress hormones thereby liberating progesterone, which is good for the cardiovascular system and can be used as a general tonic for both men and women since it works in its own way and not through phytoestrogens as some other herbs. Motherwort has also been found to improve fertility and reduce anxiety associated with childbirth, postpartum depression and menopause. Pregnant women using it in early labor find it will ease labor pains and calm the nerves after childbirth, however it should not be used during pregnancy as Motherwort can also be used to bring on a delayed or suppressed menstrual flow. 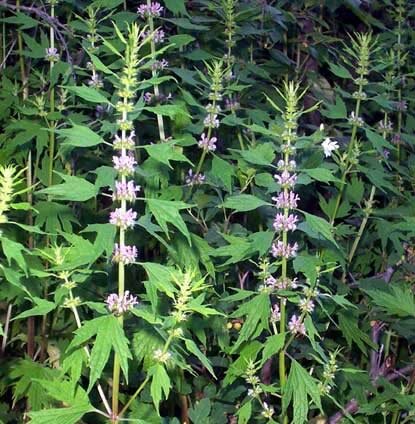 Motherwort also reduces fevers, and is frequently suggested for illnesses with nervousness or delirium. Motherwort has been used to treat rheumatism and lung problems like bronchitis and asthma, usually in conjunction with other herbs such as mullein. Motherwort may help an overactive thyroid but does not depress normal thyroid function. Motherwort is often prescribed with Hawthorne Berry as a heart tonic. In the Victorian Language of Flowers it symbolizes concealed love. Note of caution: Motherwort should not be used with clotting disorders because of its possible anticlotting effect. Due to its cardiotonic properties, the herb may interact with blood thinning medications, and should not be taken with sedative medications and sleeping pills. The fresh leaves of Motherwort occasionally produce skin dermatitis when touched. Hummingbird Creations offers a potent extract of Motherwort, using the aerial parts of our homegrown motherwort and extracting it in a base of 100 proof vodka. We let it work at least six months before decanting and bottling for use to assure its potency. We also produce a Hawthorne Berry Extract, another wonderful herb for the heart! See our article on Hawthorne berry.